1,000 HP Clutch Upgrade! Archives - SoScary - the story! 1,000 HP Clutch Upgrade! Archives - SoScary - the story! Category Archives: 1,000 HP Clutch Upgrade! If you are a newcomer to my Blog, the story behind my Shelby, “SoScary”, starts here. It came as no surprise that upgrading to 800HP would accelerate clutch failure. I was actually quite surprised the OEM one lasted as long as it did. In April, 2017, I entered a freeway and hit the gas in 4th to punch out to the fast lane and I could hear the rpm surge way beyond actual road speed. This was the first clue – and it started doing it every time I applied power, so clearly, the clutch was shouting “help”. The car had 27,500 miles on it. I had already started doing some preemptive research on clutches and there are several popular ones to choose from. What I was wary of was those models that “rattled” in neutral or were clunky in traffic. Out of all the models I considered, I ended up choosing the Mantic 1,000HP Cerametallic Twin Disc Clutch which at close to $2,000, was not the cheapest on the market, but it did come with a new throw out bearing and a lightened steel flywheel. 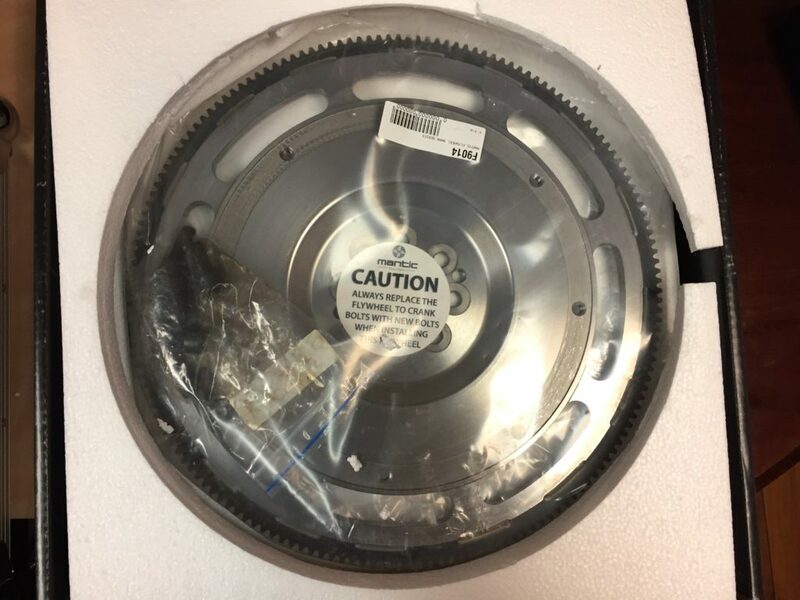 If you are going to replace the throw out bearing, this is definitely the time to do it and the idea of the lightened flywheel appealed to me (more on this later…). 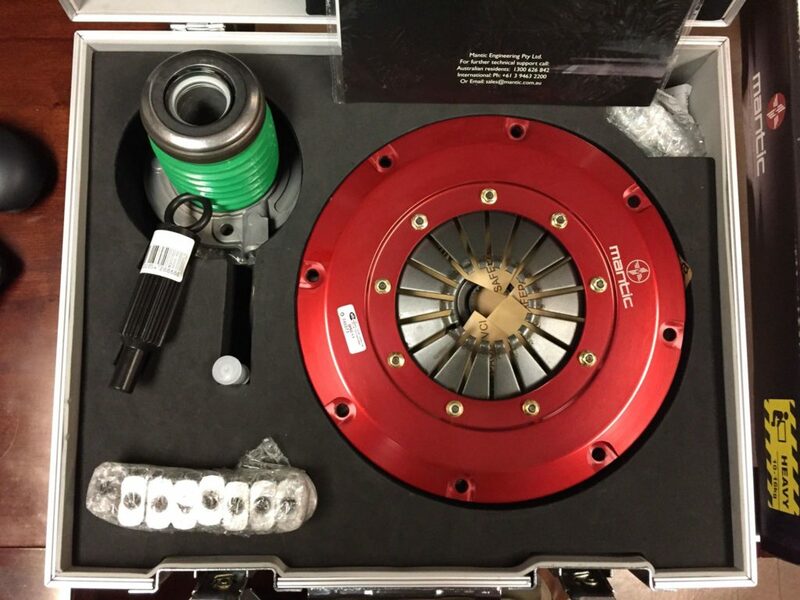 The Mantic 1,000 HP clutch kit comes in this really cool case! So in May of 2017, the clutch arrived and I booked the car in for the replacement (this sort of job requires a lift for sure!) I used my local Ford Dealer who have certified SVT mechanics. I also got the clutch line replaced with a braided steel line. The car was ready two days later and they warned me that the new clutch was pretty rough as it would need breaking in – that was an understatement! The pedal feel was about the same but it came in a bit higher on the pedal; however it had about two modes – all or nothing. The lightened flywheel meant less inertia so without some rpm; there was a danger of stalling, particularly as the new clutch would bite hard. The break in period was about 600-800 miles so I daily drove the car for weeks to give it lots of shifts and avoided any hard acceleration or clutch dumps. It was pretty brutal the first couple of weeks but gradually it got better but in neutral with the pedal off the clutch there was still quite a pronounced rattle – which was just what I was trying to avoid. After every 1,000 miles, however, the clutch became smoother and smoother and the rattle all but disappeared. At the time of writing this (Dec 2018 at 43,500 miles), its turned out to be a great clutch. It’s smooth as butter and instills a lot of confidence. It still bites harder than an OEM one and I still need to take off with more throttle, but it’s nothing like the all or nothing one it was like when new. For sure, a lightened flywheel revs more quickly! A couple of Shelby friends of mine have since driven the car and both got used to it very quickly. Next up: Brakes, Tires and Safety Upgrades! Tech Talk - Under the Hood - SoScary - the story! on 1,000 HP Clutch Upgrade! Brakes, Tires and Safety Upgrades! Upgrading SoScary to 800 HP!